You know that scene at the beginning of Back to the Future where Marty tries to play his guitar in front of the giant speaker and it knocks him off his feet? The Rockford Fosgate Mini SoundLab is basically that in car form. Maybe "van form" is more accurate. Rockford Fosgate packed this Ford Transit Connect so full of speakers, subwoofers and amps that I'm not sure anyone can even fit inside. But if they do manage to get in, the company highly recommends sound-deadening ear phones for each occupant. Seriously. Why is ear protection needed? 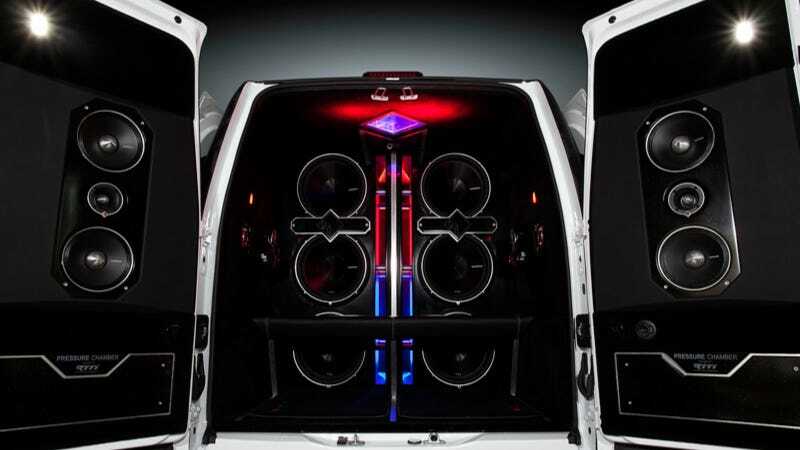 Because when you step inside, you're subjected to the full fury of 12 speakers including six 15 inch subwoofers, four midrange speakers and two tweeters all fed by four amps generating as much as 3,600 watts. They call the rear area a PRESSURE CHAMBER. In caps, because they're not messing around. When I read the description of the van from Rockford Fosgate, I'm actually filled with dread. Once the doors close and faced toward the Punch Pro speakers “It feels like they could possibly rip your face off” states Brian Von Pasecky, one of the vehicle fabricators. There's more aural mayhem up front too, with an amp that drives a pair of 6.5 inch component systems, while yet another amplifier powers two 10 inch subwoofers. The speaker maker says they'll be building several mini SoundLab vehicles to tour the country as part of their ongoing War On Hearing. Or at least, to show off how cool their speakers sound. I'm glad this thing exists. I've been saying for some time that there's just not enough Ford Transit Connects out there with the power to rip your face off using raw sound.